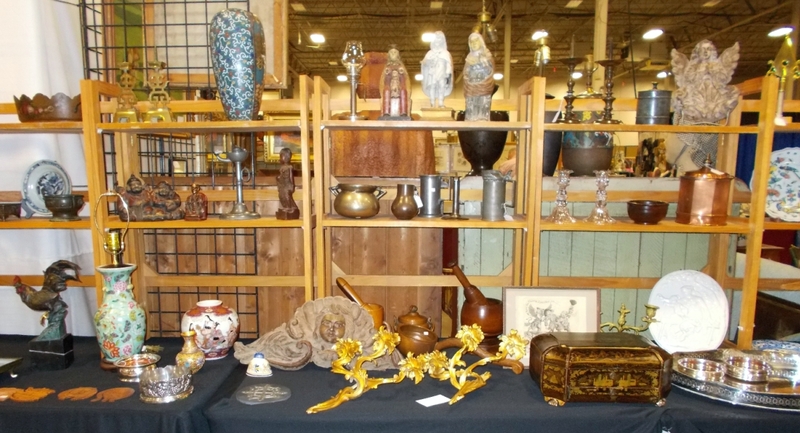 George Shahady Antiques, Bridgeport, W.Va.
CHANTILLY, VA. – Show manager Joan Sides said she was pleased with the latest edition of DC Big Flea and Antiques Show, July 21-22. Heavy rains on Saturday and some on Sunday only seemed to increase attendance and the amount of time shoppers spent indoors at the show, Sides said. 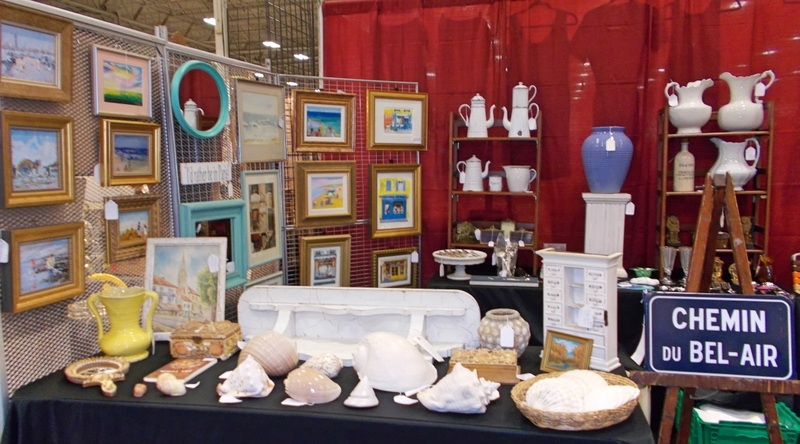 Exhibit space was sold out about two weeks before the show, with more than 600 booths filled with antiques, home décor, art and collectibles. Styles have been changing over the years, and this show is keeping up with those changes. 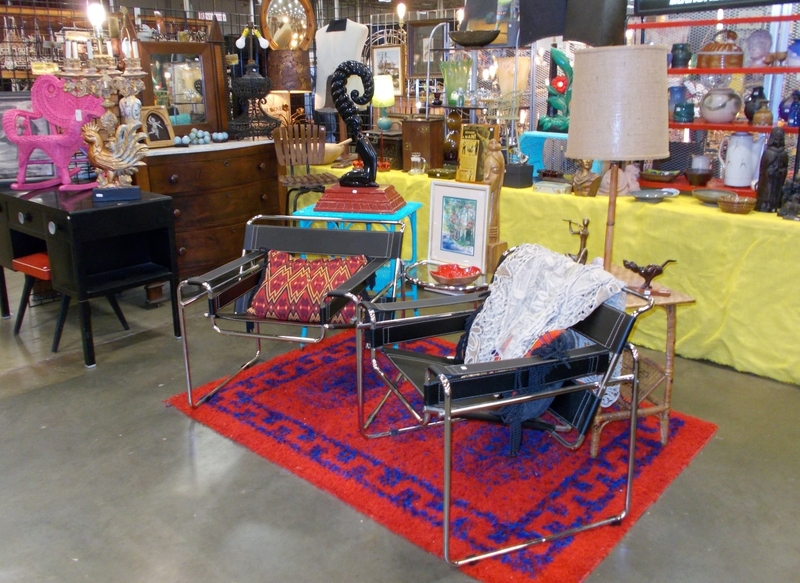 There were many exhibitors offering Twentieth Century vintage décor as their mainstay, and Midcentury Modern, which is popular these days. 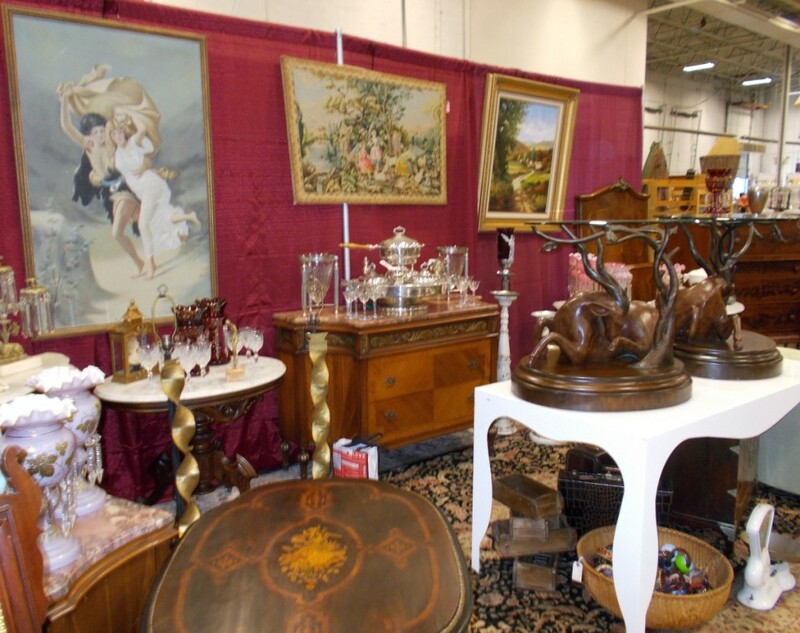 The Mix Vintage & Antiques, Denver, Colo., has become a frequent exhibitor here with, as owner Lisa Simoes-Correia calls it, the Hollywood Look. This is not the same as Danish Modern or Formica-covered furniture, but a mix of high-quality design pieces made with natural materials, as well as glass and chrome. 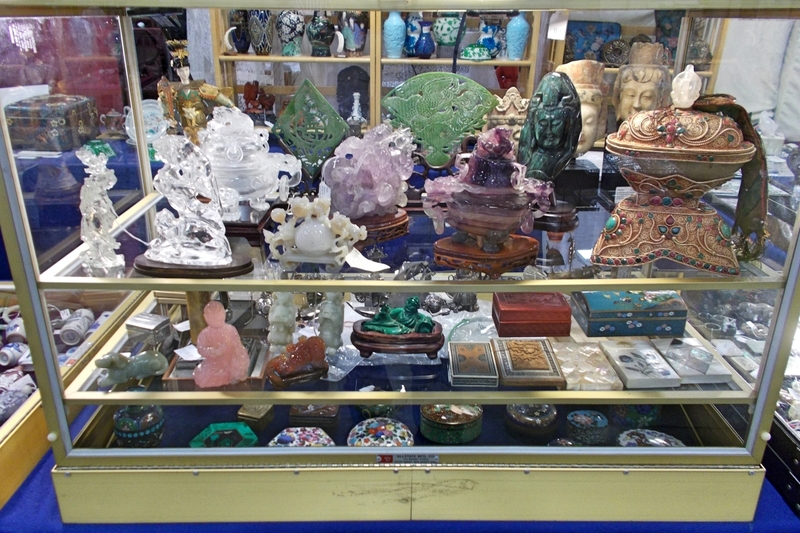 Sales in July included one of a matching pair of Chinese tall cupboards and an assortment of accessories. 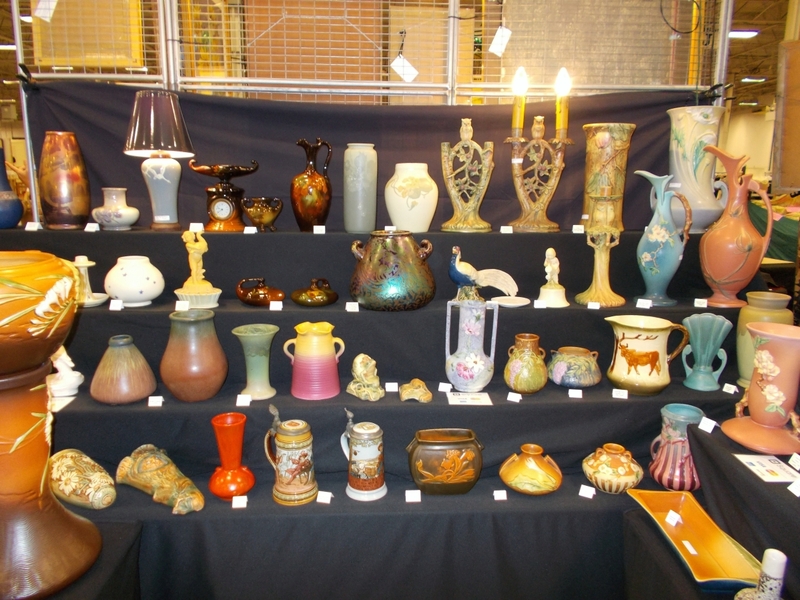 Patricia Herman’s only regret was that she did not bring more of her collection from her home in Berwick, Penn., for she virtually sold out at the show. 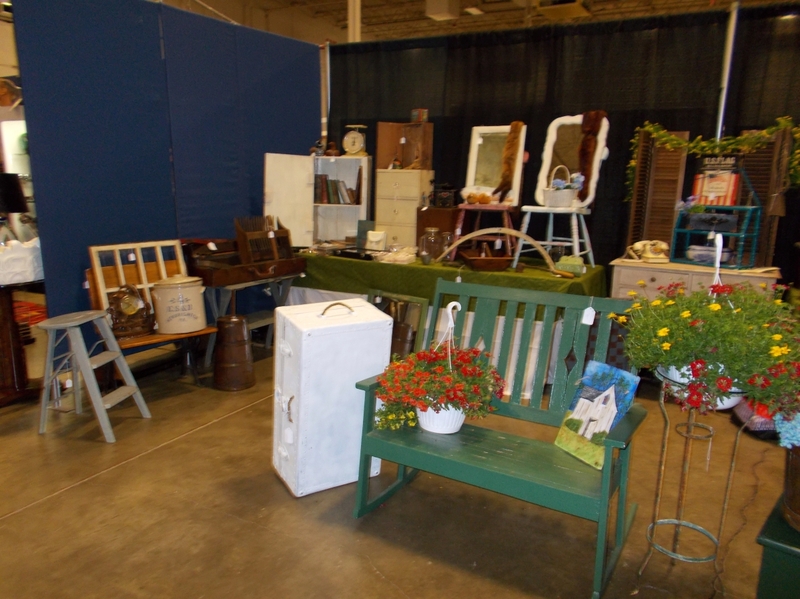 Nearly all the furniture in her booth was what is described as cottage style – simple painted pieces. For example, she had a love seat that resembled a porch swing, several painted chairs, a cottage pine chest of drawers, all of which sold. 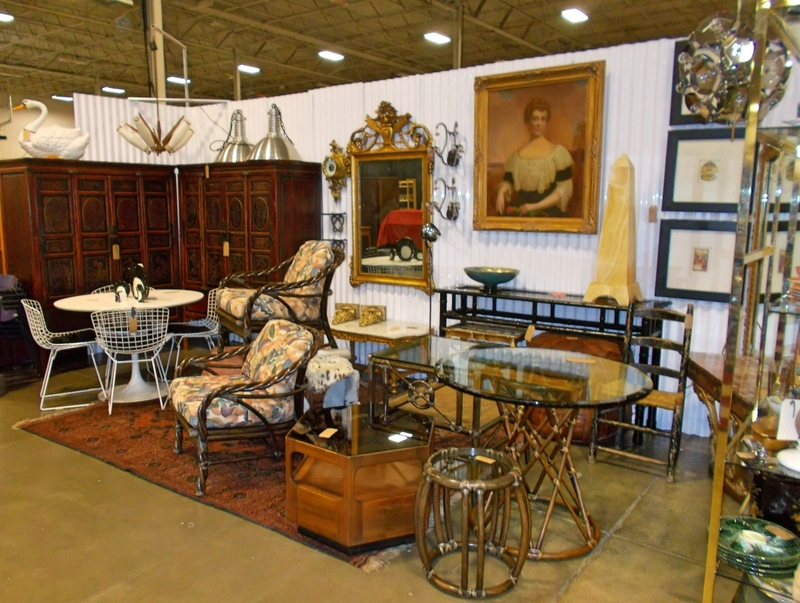 Even many of her small pieces went home with new families. 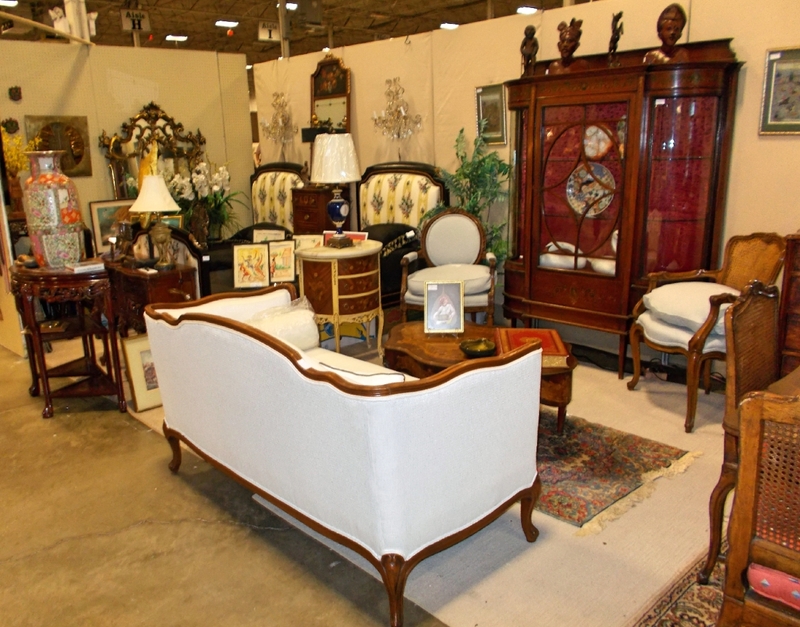 In contrast, Cherry Hill Liquidators, Cherry Hill, N.J., was selling from its inventory of elegant furniture and accessories, including an ensemble of white furniture best described as French Provincial. A large armoire, a pair of chairs, accompanying side tables and a smaller chest of drawers would be perfect for a large bedroom – all that was missing was the bed. 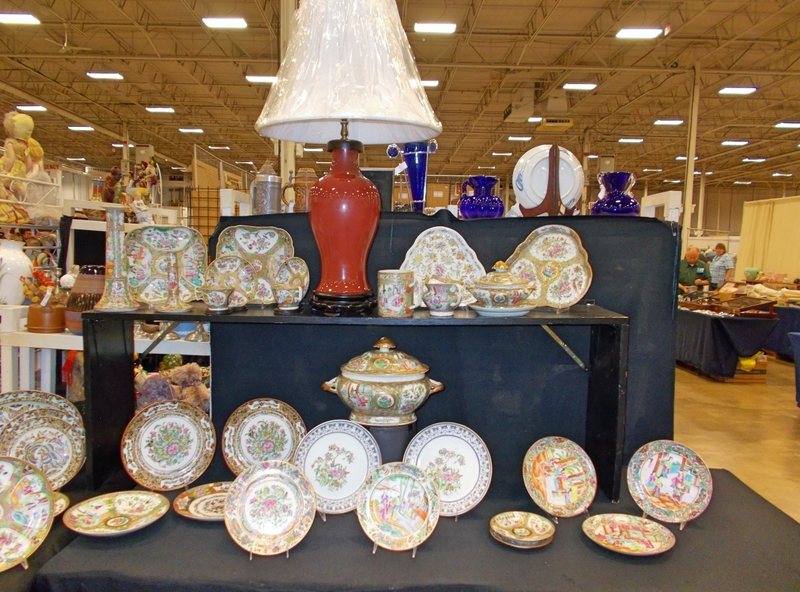 Lara Joyce, of Lara Joyce Antiques, travels to England and Europe a few times each year to gather inventory, which consists mostly of little home accessories. 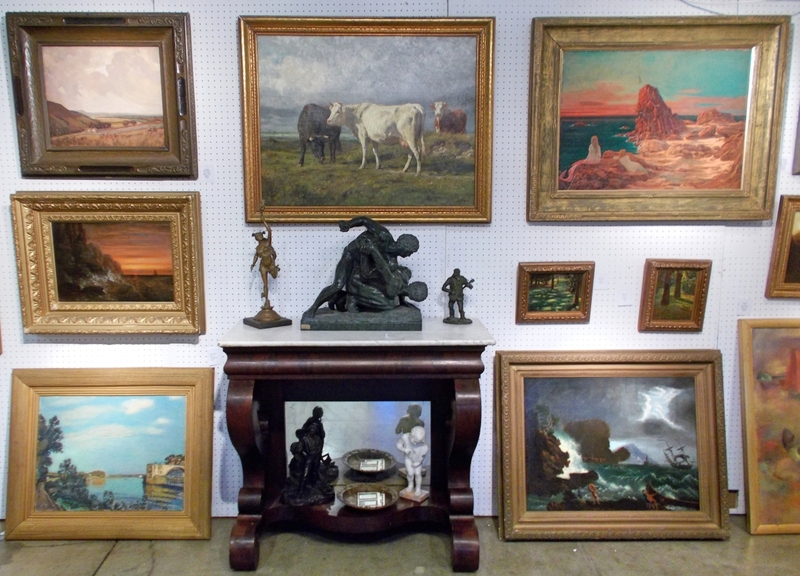 This month, the Westfield, N.J., dealer’s display included an assortment of Nineteenth Century English silhouettes, brass and silver candlesticks, Staffordshire figurines and a wonderful collection of Eighteenth Century boxes: such as traveling desks, tea caddies and jewelry safes. Modeling their antiques, Freddi Brubaker (left) and Charlotte Bevers were also putting the finishing touches on their display of vintage fashions. 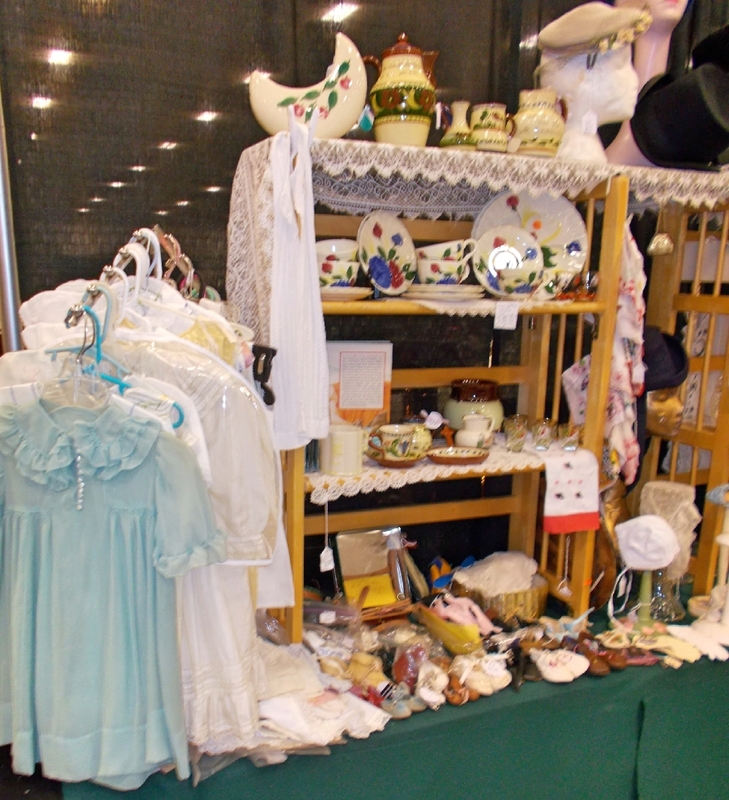 A fun collection of toys and holiday pieces from the past adorned The Village Antiques booth. 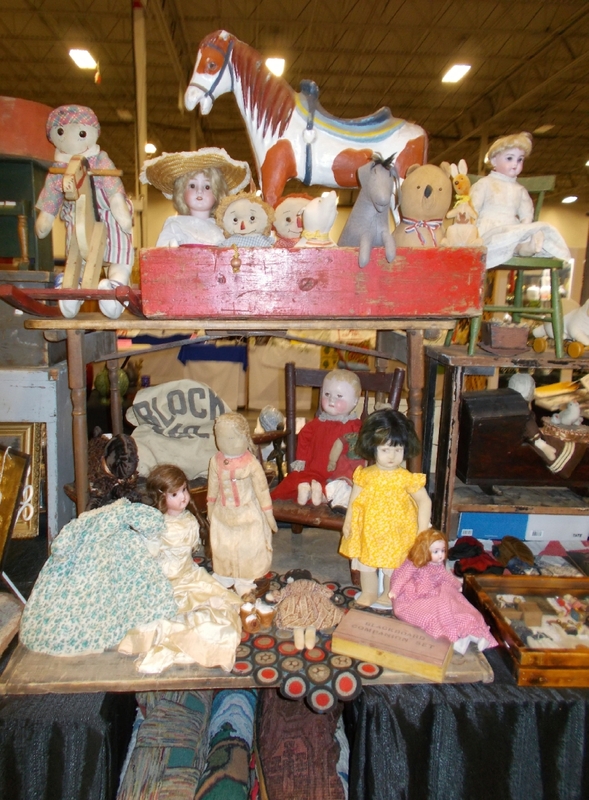 The Syracuse, N.Y., dealers brought dolls and lambs made from spun cotton about 150 years ago that sold early in the show; Santas with bisque faces in felt costumes and wooden doll cradles, probably made by a father or grandfather in the Nineteenth Century for a much-loved child’s doll collection, were on display. 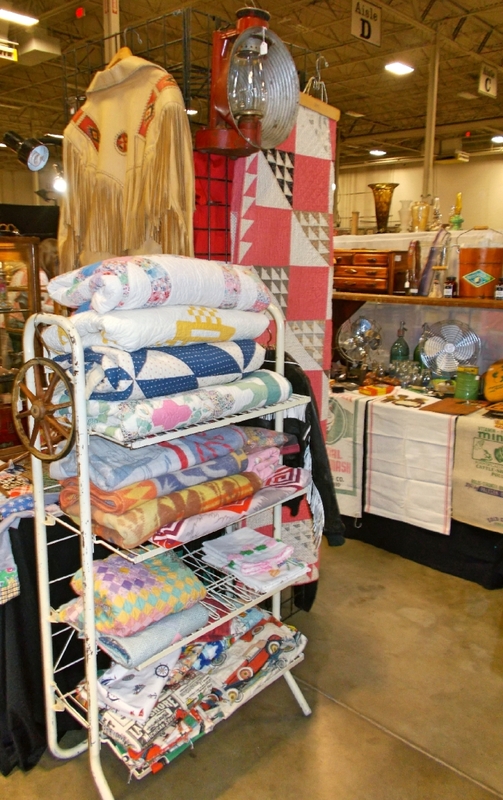 Coming in from Hebron, Neb., Don and Sheri Simpson were selling a large collection of handmade quilts and some turn-of-the-century Native American crafts. The quilts were attracting the most attention as they were all hand sewn, in good condition and nearly all around 100 years old. Accessories from the Art Deco period are the stock and trade for Past Pleasures Moderne of Annandale, Va. Don Selkirk has been building his collection for years, and it includes aluminum and Bakelite clocks, radios and home appliances from the 1920s forward, as well as sculptures from the same time period. 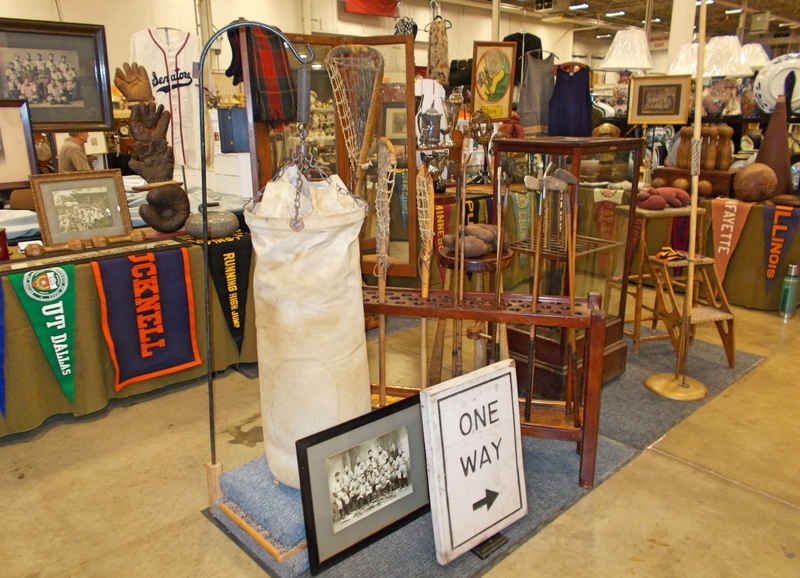 Sport and Spool, Goldsboro, N.C., offered its collection of Twentieth Century sports equipment and early college and professional sports memorabilia. 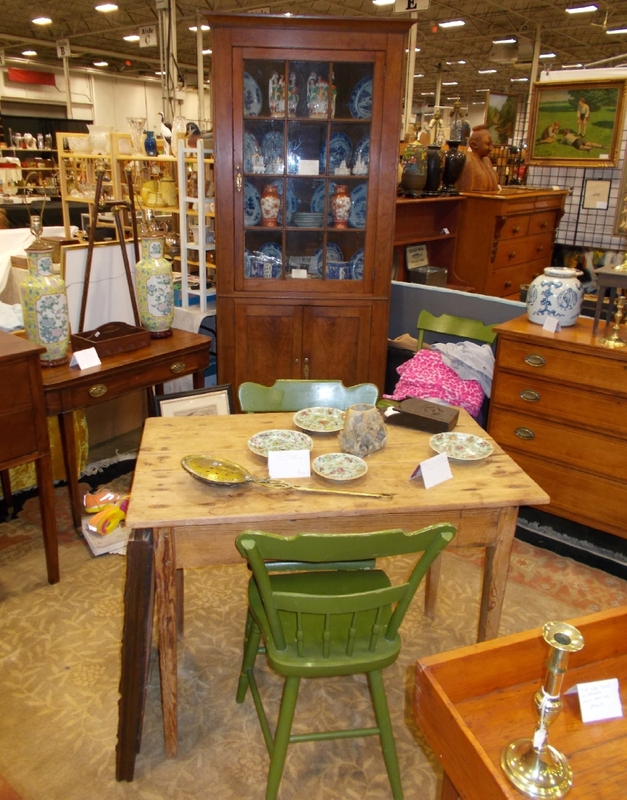 Buddy Lunceford, Rixeyville, Va., has late Nineteenth Century furniture to sell. 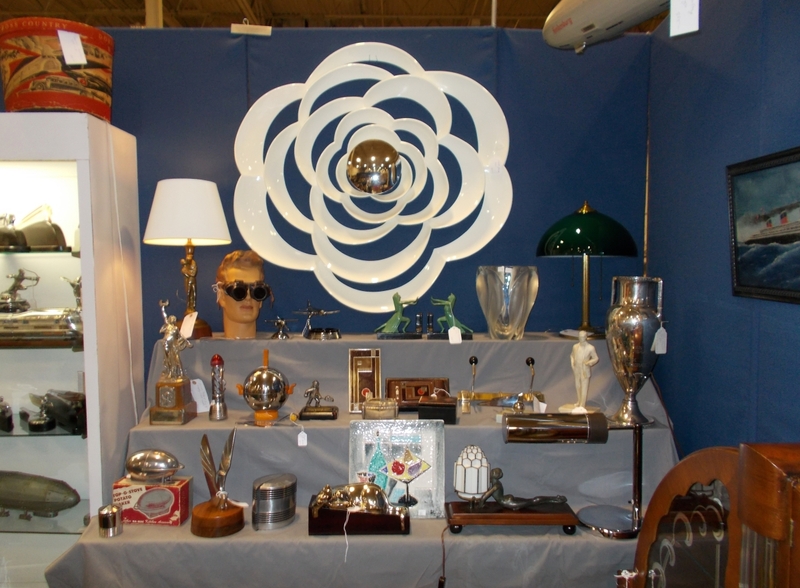 This month he brought several chests of drawers, a double-wide filing cabinet, several dressing stands and more; and as usual he came close to selling out of his stock. 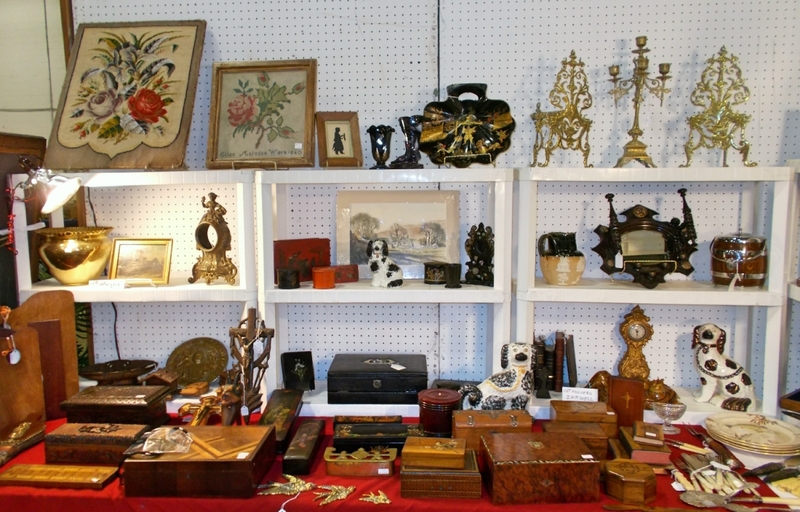 And there was much more on offer: Wintergreen Farm, Fort Mill, S.C., was selling vintage child’s dresses; Chinese Export dishes were on offer at the booth of Donald Ourecky, Springfield, Va.; George Shahady, Bridgeport, W.Va., was showing and selling his assortment of Eighteenth and Nineteenth Century furniture. 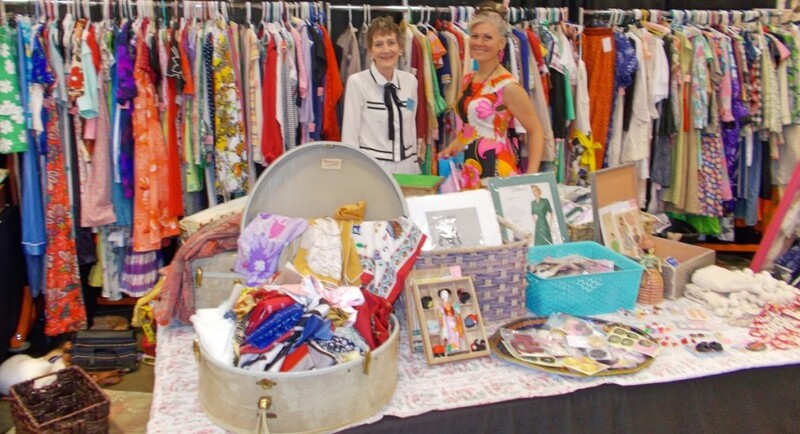 DC Big Flea & Antiques Market runs six times a year. The next two shows are September 15-16 and November 2-3. 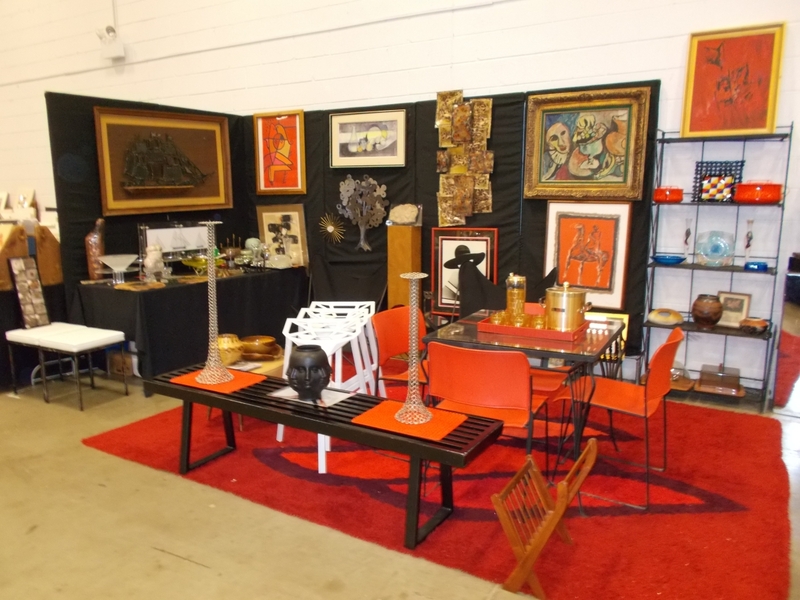 For information, 757-430-4735 or www.thebigfleamarket.com. Ray Mason & Jose Garcia, Warrenton, Va.